Absinthe is an anise-flavored spirit banned in the United States in 1912 in part because its namesake ingredient, Artemisia absinthium, or wormwood, is known to be toxic in large doses. Absinthe containing acceptable amounts of wormwood is now available in the U.S. It's a terrific substitute for sweeter, lower-alcohol pastis. 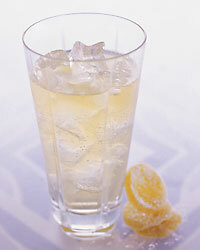 Cocktail: The citrusy Bitter Anise, prepared with absinthe-like pastis and muddled lemon, and topped off with ginger ale. Aperol is a bitter orange Italian aperitif flavored with rhubarb and the gentian plant. 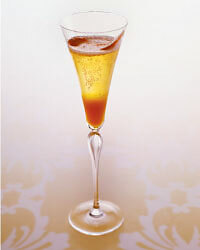 Cocktail: The sparkling Bitter Peach, made with Aperol, Champagne and peach puree. Bitters are a super-concentrated solution of bitter and often aromatic plants that adds flavor and complexity to drinks. Varieties include orange, lemon, peach and aromatic bitters, the best-known of which is Angostura. Fee Brothers bitters is a brand made in Rochester, New York, for more than 60 years, with flavors like orange and peach. Cocktail: The Hat Trick, prepared with Prosecco and bitters; the name is a tribute to Joe Fee, who is known for tipping his ever-present fedora in greeting. Cynar is a pleasantly bitter Italian liqueur made from 13 herbs and plants, including artichokes. 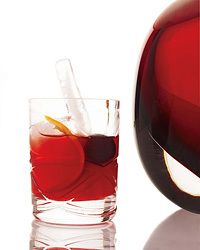 Cocktail: The quirky, sparkling Amer Mousseux gets its love-it-or-hate-it bitterness from Cynar as well as another Italian liqueur, Campari. Lillet is a wine-based French aperitif flavored with orange peel and quinine. The rare rouge (red) variety is sweeter than the more widely available blanc (white). 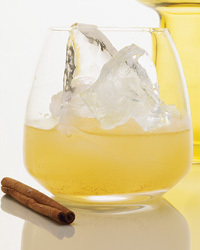 Cocktail: The Seville, prepared with Lillet Blanc and fino sherry. Maraschino liqueur is a clear Italian liqueur, the best of which is made from bittersweet marasca cherries and their pits, aged in ash barrels and sweetened with sugar. Cocktail: Mark's Sidecar, by Mark Mendoza of L.A.'s Sona; "This sidecar is the Domaine de la Romanée-Conti of cocktails," he says. Mezcal is an agave-based spirit with a smoky flavor that comes from roasting agave hearts in fire pits before fermentation. The best mezcal is made in Mexico 's Oaxaca region. 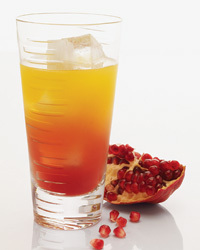 Cocktail: The fruity El Gusano Rojo, made with mezcal, passion fruit nectar and ginger beer. St-Germain elderflower liqueur is a French brand of lightly floral liqueur with hints of pear, peach and grapefruit zest. It's made from macerated elderflower blossoms and eau-de-vie (grape spirit). 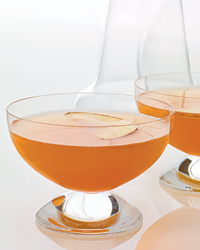 Cocktail: The St-German-accented Manzarita gets it autumnal feel from apple juice and cinnamon. Sherry is a fortified wine from Spain's Jerez region. Varieties include dry styles like fino and manzanilla; nuttier, richer amontillados and olorosos; and viscous sweet versions such as cream sherry. Sweet, nutty East India sherry falls somewhere between an oloroso and a cream sherry in style. 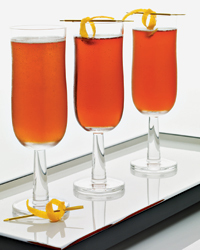 Cocktail: The Sherry Cocktail is a sherry-spiked riff on a brandy sour. 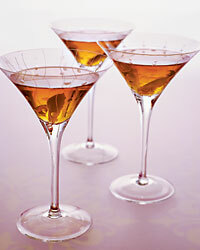 Vermouth is an aromatic fortified wine. It can be white or red and ranges from dry (used in martinis) to very sweet (often served as an aperitif). Bianco vermouth is an aromatic, sweet Italian white vermouth traditionally served on the rocks. 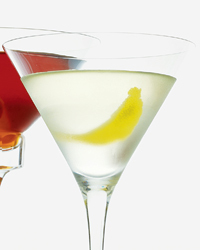 Cocktail: This Martini, prepared with dry vermouth, was created by New York City star mixologist Jim Meehan.